I felt like the only kid who'd ever dealt with having the people I loved most in the world snatched away from me. It would have meant everything to know that someone, somewhere, had survived what I was going through. For the thousands of nameless kids and teenagers who feel forgotten like I did - this memoir is for you. It's as much for your healing as it is for my own. In my neighborhood growing up, the sense of community between Latin American immigrants was strong. I want that community to reach across the whole country - standing together for what is right. Reading this My Family Divided, I came to better understand, and was deeply moved by, the many ways being the child of undocumented immigrants shapes and changes a child's life. The silence and secrecy necessary, the constant efforts not to draw attention to herself or her family, left Guerrero without support and help from her school and teachers after her parents were deported. While teachers clearly recognized that she was struggling and not herself, Guerrero feared the repercussions of talking about her home life. This constant pressure and anxiety affected her ability to perform at school and to see a future for herself. Of her high school years at Boston Arts Academy, Guerrero, who loved to perform as child but kept it mostly to the family's living room, often thought to herself, "If only I'd realized sooner that I had just as much a right to access art and culture as anyone else did! Simply being in this new environment lifted my expectations for what was possible in my life, even with the uncertainty at home." This kind of access, and the fact that the students I work with do not have it, is something that I think about every day. Every time I get a hug or have a fantastic conversation with a student, I can't help wondering if I am talking to the next Elon Musk or Diane Guerrero, given the right opportunities. Guerrero's story is one of success, ultimately. She is a college graduate and a working actor, appearing in Orange is the New Black and Jane the Virgin as well as working for social justice and community engagement, volunteering with the non-profit Immigrant Legal Center and Mi Familia Vota, an organization that promotes civic involvement. But, her struggles are many and often seemed insurmountable. Guerrero struggled with an undiagnosed learning disorder, depression and, eventually, self-harm. Not fully understanding the student loans she took out to pay for college, she ended up in serious debt and contemplated suicide. 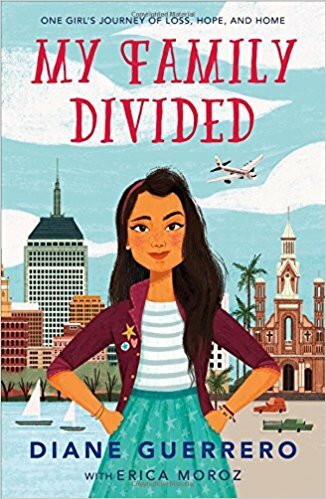 My Family Divided: One Girl's Journey of Loss, Hope, and Hope is important both for the light Guerrero shines on what it means to grow up the child of undocumented immigrants as well as the hard work it takes, especially without the support of the people you love most in the world, to make a meaningful life as an adult. On the one hand I stood out for looking "different" and being a first-generation American, on the other I was also treated as invisible - my history and background were barely treated as worthy of discussion. My peers had no idea what I'd been through and it made me furious. I never want my students to feel invisible (or furious) and I am always talking to them about their lives, their interests. However, because of their age, which affects their ability to articulate their emotional experiences, I don't feel equipped to have those deeper, more serious conversations with them unless they initiate it or it comes up organically. My Family Divided: One Girl's Journey of Loss, Hope, and Home is the conversation starter that we need and I hope it finds its way onto the shelves of every school library and into the classrooms of every school. While it may not possible to separate the legal aspects of undocumented immigration (as well as the veiled and, more increasingly, conspicuous racism that accompanies this issue) it is vital to the health of our nation to pay attention - positive attention - to the children of immigrants who will be joining the workforce and voting in the next decade or two. According to the Pew Research Center's Hispanic Trends Project, there are an estimated 16.6 million people in the U.S. who are part of families with at least one unauthorized immigrant. And, depending on your news source, you may have heard reporting during the recent separation of parents and children crossing the border, about the longterm mental, emotional and physical effects of this type of childhood trauma. Again, as someone who works in a public school with children experiencing the traumas that come with the loss of a parent as well as constant anxiety about the potential loss of a parent, in addition the effects of growing up in poverty, I can attest to the fact that the stress of their lives affects their academic day in a multitude of ways. 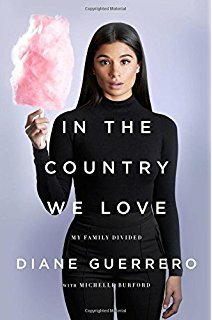 Thank you, Diane Guerrero, for being brave enough and bold enough to share your story and bring these issues to light.